Sugar Gold came to us off the track, and has started his new career as an event horse. Sugar has been to a USEA sanctioned event and participated in all three phases. Currently schooling Beginner Novice with the potential for much more, Sugar is ready to be adopted! Sugar Gold is suitable for an experienced rider looking for a fun green horse to take up the levels. Kat has a fun personality and is quite the flashy mare. 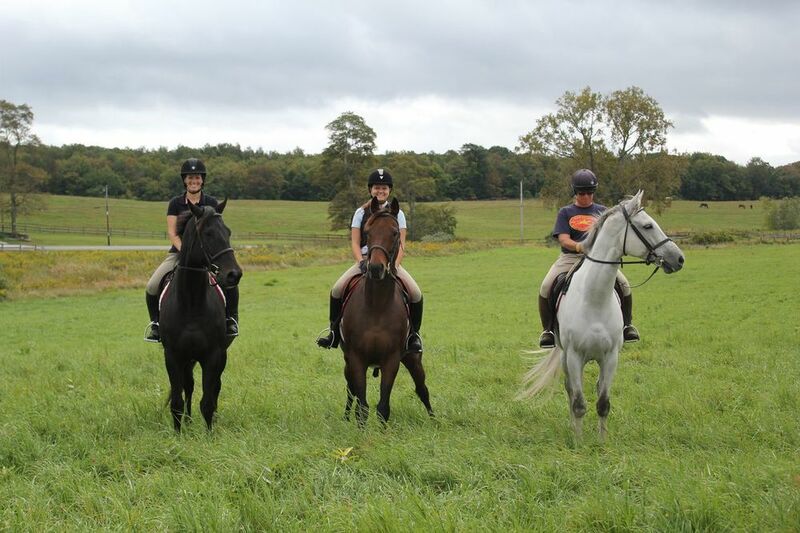 Kat has three nice gaits and a beautiful jump. Because she is still green over fences, Kat is suitable for an experienced and serious rider. Kat would be eye-catching in any ring. Redeeming Factor is a fun, easy ride and a quick learner. 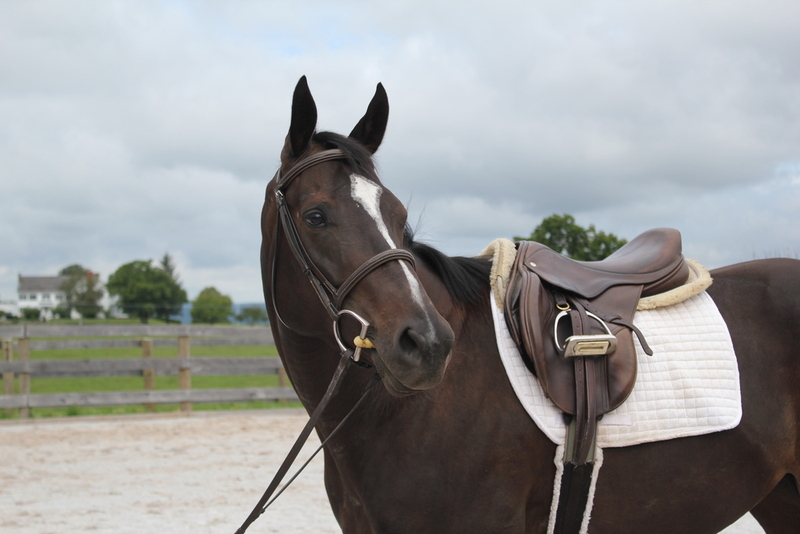 Her friendly personality makes her suitable for an amateur rider or someone looking for a fun project horse. 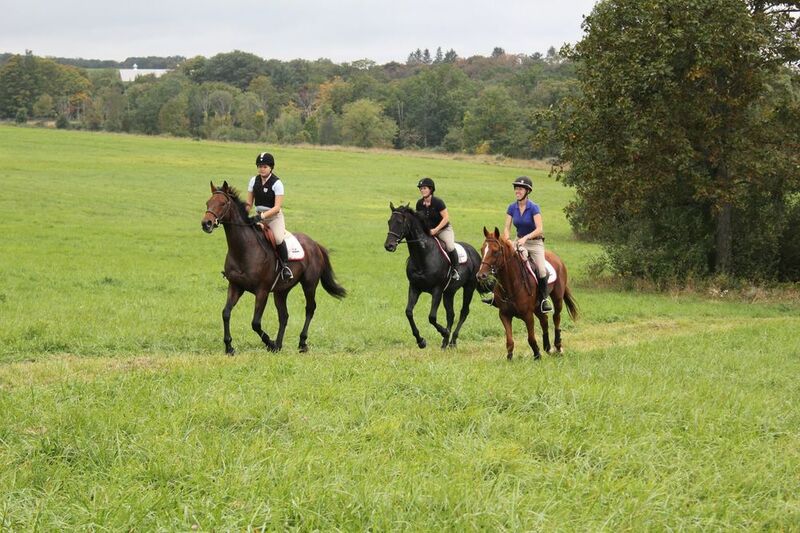 Redeeming Factor has three nice gaits and good ground manners. There are endless possibilities with this mare! Bud Bud Buddy was trained to race at the track, but never raced. 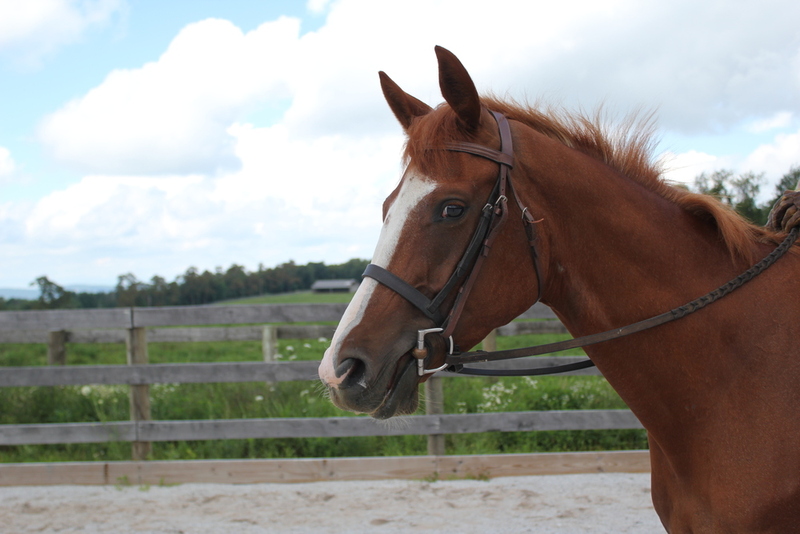 Buddy is a cute gelding who wants to please, on the ground and under saddle. With three nice gaits and potential for much more, Buddy is suitable for a young rider or an adult amateur looking for a fun horse to work with. "I can't tell you what a perfect match this horse is for Nancy. They are doing beautifully together and Helen, whose name is now Willow, is the sweetest, most laid-back gentle girl I could possibly ask her to be. I can't thank you enough for matching them up. We love her!" Spirit has never raced. He has crooked front legs so he was not started under saddle till this past spring (2015). Spirit is going walk, trot and canter and is a very nice mover. He is a very sweet boy. He stands great on the cross ties. Spirit is still green but he is very willing. Ziggy has never raced. She spent last year being trained Western-style as a competitor in the A Home For Every Horse Equine Comeback Challenge, and is now starting her English-saddle career at Akindale. She has no injuries and no vices and great ground manners--look at her pose for the camera like a pro! She's had a few months off and is starting up again, but has good fundamentals at walk, trot, and canter. She's a big-bodied girl who feels larger than her 16 hands, but a gentle personality. This mare would make someone a nice prospect in a variety of disciplines! 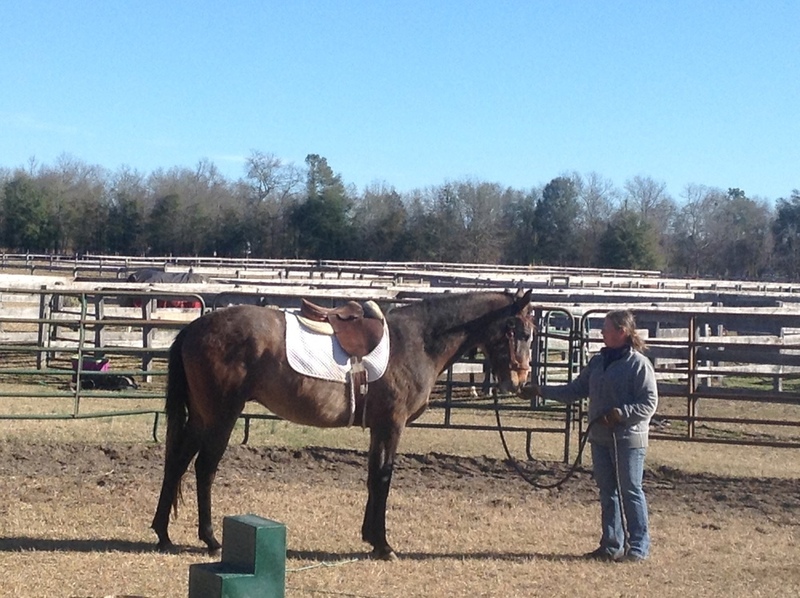 7 year old 16.3 hand Thoroughbred gelding for adoption. Rock is big, sweet boy who would love to be someone's pet. 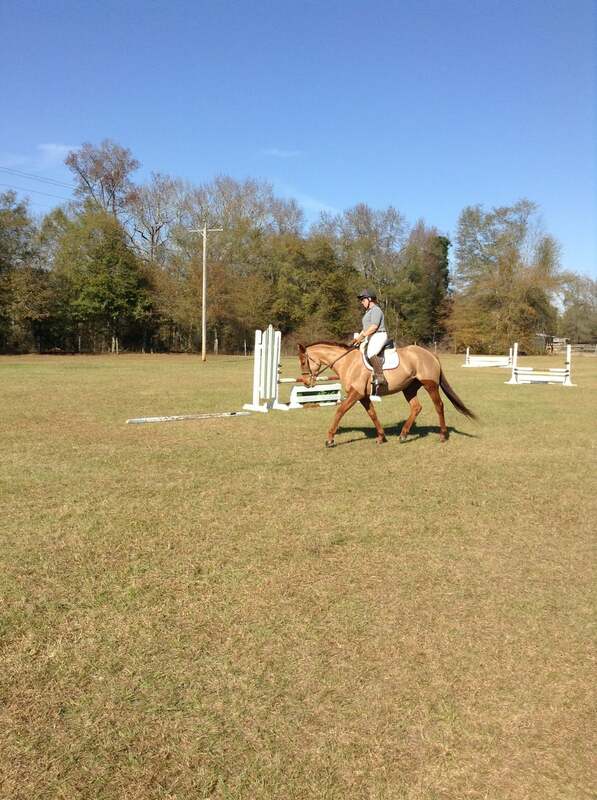 He has a solid training base and is great in the ring and on trails. Crosses creeks, ditches, and will jump small jumps. He is a naturally quiet, uncomplicated horse but is still green and is not for a beginner or weak rider. He will round up on the bit and has lead changes both directions. He has a big trot so is not for someone who has hip or knee problems. Large enough to carry a man. She is going walk, trot, canter. She is consistently getting both leads now. She will trot a jumping course of small cross rails. She trail rides nicely and will either lead or follow and we have ponied off of her while on the trail. 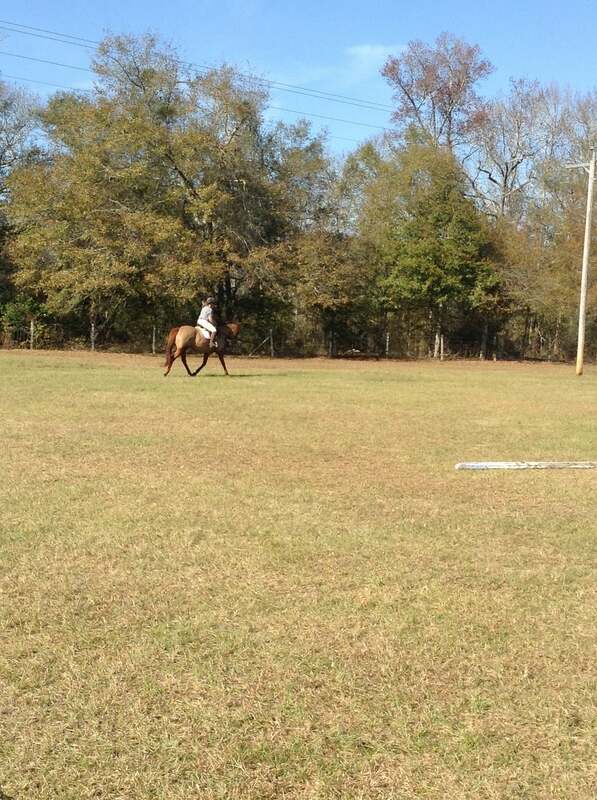 She also tried out Western Tack and looks pretty good! This horse can go in any direction. She does have a splint in her left front that is old and cold. TAKE A MOMENT TO WATCH HER VIDEO! Magical is a sweet guy full of personality! He goes walk, trot and canter and is very quiet horse. He is more whoa than go and a very nice mover. He does have an old injury which limits him to flat work. Magical went out on his first trail ride and was a good, good boy! This filly has a very good attitude. She's nicely put together; Heather says "she's got a good brain." She's young and still growing but in time we think she'll make a great horse. 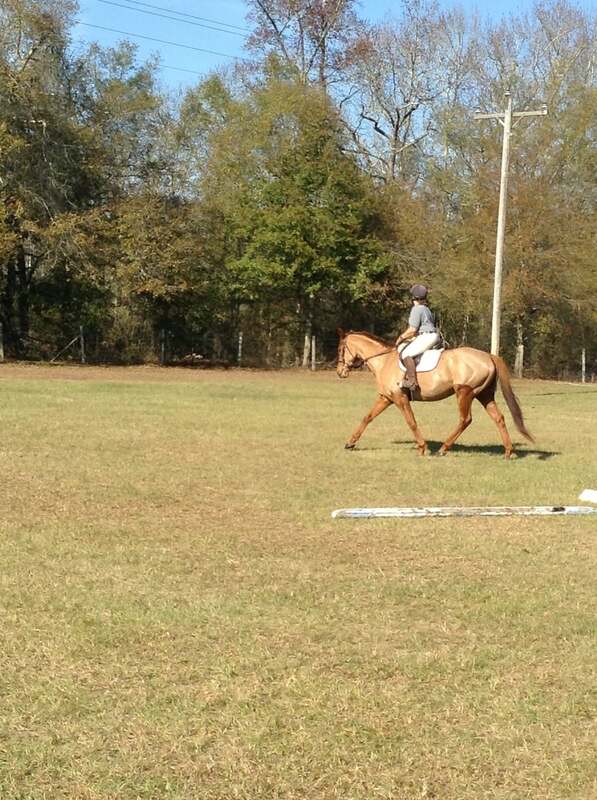 She is going walk, trot, canter and also goes over ground rails. She has front shoes. Sedona is a sweet little mare! She has a slight build. Sedona has had a lot of training since retiring from racing. She goes walk, trot, canter in a nice frame and jumps small jumps. Sedona is a nicely schooled flat horse and a pleasure to ride. She does have an old injury that would make her a low level jumper or a lovely flat horse. Scooby has only been in training for a second career for a few weeks now. He is a sensitive boy that will need a confident rider to bring out his true potential. Scooby truly is a giant baby still! He cribs. Byron is coming along nicely. He has been in training for a second career for a little over a month now. He gets both leads but is also just learning to use his body correctly. He has a been there done that attitude, nothing seems to phase him! Jess Not Jesse was well cared for on the track and still gets visits from his old owners. He's going walk, trot, canter, gets his left lead and is working on his right. He's a cool horse with a good personality and the more he works, the more easygoing he gets. He'd still do best with a more experienced rider; he's learning to reach down for the bit and has nice gaits. He is barefoot. 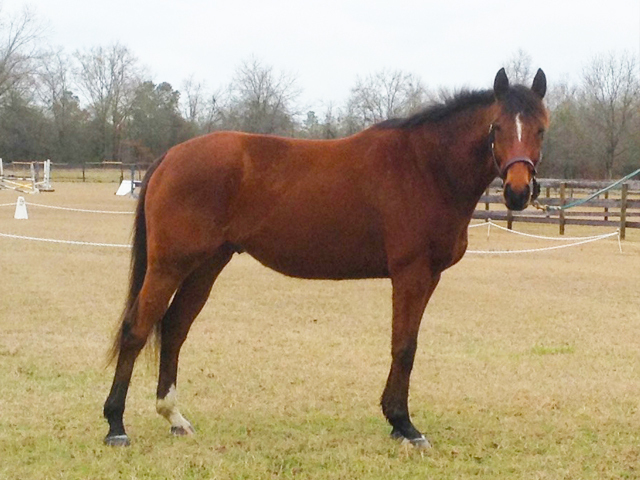 Oklahoma Ace is entered in the Retired Racehorse Project 2015 Thoroughbred Makeover Project! If you adopt him, the entry comes along with him. Says Heather, "He is really a cool horse!" He's going walk, trot, and has a really nice balanced canter, getting both leads easily. We think he has great potential for the future. He has a fun personality--he can be a little cheeky, so would be best with an experienced rider to bring out the best in him. He also lunges both ways, is happy to stand on cross ties, and is currently wearing front shoes. Frisky Cat is well started on the flat, a good mover, and a great jumper with automatic lead changes. 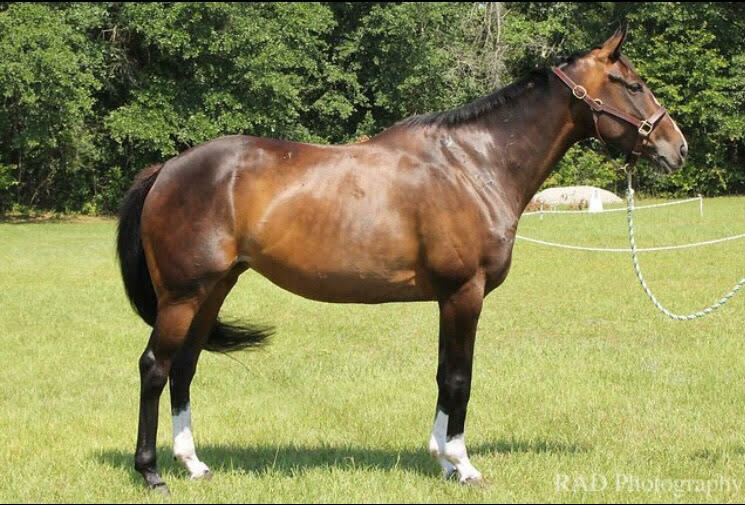 He has a huge personality and in time will make a wonderful young adult's horse. He is also extremely well behaved going out in a group through the country. He is not for a beginner but is ready to go. Check out the video below of him jumping a course! Nugget of Wisdom is a big, sweet, mellow guy who loves attention (and treats). He's going walk, trot, canter, gets his right lead and is working on his left. He's got super comfy gaits and is a pleasure to ride. He was well loved in his last home and is looking for someone else who will love him as much. Nugget would probably be OK for an adult beginner. He's got excellent ground manners and has just gotten shoes. 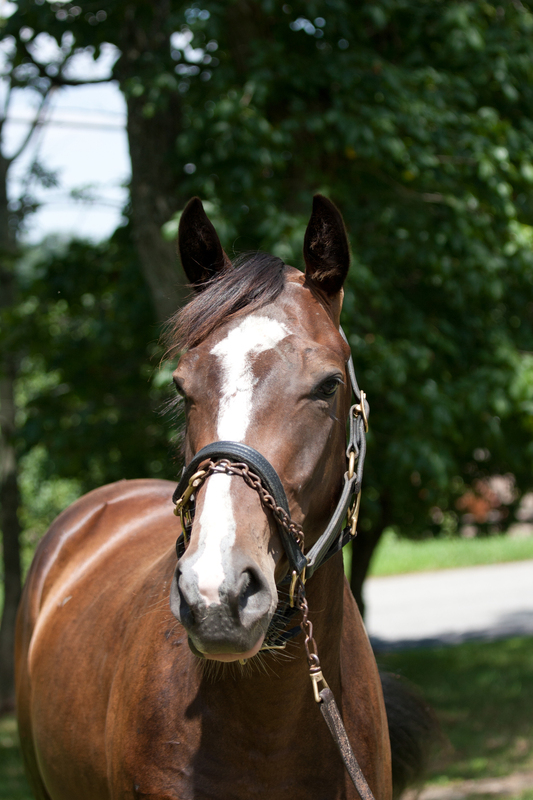 Tropical Trip is a very sweet mare who is really enjoying training for her new career. She is going walk, trot, canter and jumping crossrails--check out her cute form--and is learning to canter in a nice frame. She loves to be groomed will stand on the cross ties and does not mind staying in a stall or being in her paddock. She is great on the trails, too! She is quiet enough for an advanced beginner. Currently located in Aiken, South Carolina for the winter. Honey has never raced. She is a very quiet girl with a sweet personality, currently going walk, trot, canter and handling ground poles with ease. She is also great on the trails. Barbie Girl is just starting to work, so we will know more soon about her capabilities. She is a good mover and big bodied. Bea is a really nice mare with no limitations for her future career. She is going walk, trot, canter and jumping small jumps already! She will need an intermediate rider to finish her training. Bea is currently located in Aiken, South Carolina for the winter. Bryant has been trained--he's calm, sweet, levelheaded, with excellent barn manners. He's just started back in work and is happy to go out on the trails. He's a comfortable ride, a forward mover. Bryant is a roarer--because of this he will have some limitations in his future work, but we're not sure what they are yet. This flashy guy is a really good mover with a big personality looking for an experienced rider to bring out his best. He's been in training for a couple of weeks, is going walk-trot-canter and gets both leads. He stands quietly on crossties and has become a bit of a favorite around the barn. He has no limitations for his future. He is currently being ridden walk, trot, canter. We are working on building his top line by letting him reach down. He had a few years off and lost most of the muscling on his back. He is such a gem! When I started working with him he was a little indifferent to me, but now he is so happy to be getting attention and is enjoying being back in work. He looks forward to seeing me every day and is always waiting by the gate to be next in line. He will follow me around, even after his work is done, while I am trying to get the next horse to ride. If you are looking for a horse to be your best friend and also have fun riding....then he is your man! We have been bringing him to a stall during the day and he really enjoys a good flat out nap! Sheila is just getting back to work after having had the winter off. She goes walk, trot, canter and is also jumping small jumps. Last winter she even schooled some XC jumps! She was good to the water, ditch and bank! She is a good mover and has a forward thinking brain. She does need an experienced rider to bring her to her full potential. She has no limitations. This big filly is still growing and growing up but has a lot of potential and athleticism. She's going walk-trot-canter, is a very nice mover but is very green and needs an experienced rider. She's capable of getting both leads and has a great attitude. She is learning to cross-tie and knows how to lunge. She does have capped hocks--not a physical limitation, just slightly noticeable. She has no physical limitations for what she can do. Scofield has been in training for a couple of weeks and is currently going walk-trot. He has a big (lovable) personality and carries himself like a bigger horse. He will stand on crossties and has good ground manners. He will need an experienced rider to help him develop, and has no limits to what he can do. Theresa has some prior training and has been back in work at Akindale for about a month. This big little mare has a sweet personality and no vices with great ground manners. She's starting to go on the bit, gets both leads at the canter, and is a nice mover. She does have a bit of a sensitive mouth--she'll need a rider with quiet hands. Theresa has no injuries and no limitations for her future career. Bonita is a fancy little mare with a curious personality and a lot of athleticism packed into a small frame. She goes walk, trot, canter, picks up both leads and has smooth canter departs. This mare has good basics and is a beautiful mover. She would be best for a smaller rider, but would make a nice show horse. Bonita has no vices, great ground manners, stands calmly on cross-ties, and has no limitations for her future career. Cat is a levelheaded, calm and sweet mare. She's been working for three weeks and is currently going walk, trot, canter; she picks up her right lead well and is getting much better with the left. She has excellent ground manners as well. She's nicely put together, and big for her size--we could picture her making an excellent children's hunter or even a polo pony. She has no injuries, no vices, and no limitations for a future career. Kat was awarded some time off after being started in her riding career in Aiken, SC this winter. Since she is only 3 and a twin we decided to give her a bit of time off after our initial backing. We are starting her back to work now (Aug 2013). Her walk and trot are great, we are working on her canter, she does get both leads, but she is young and still learning.